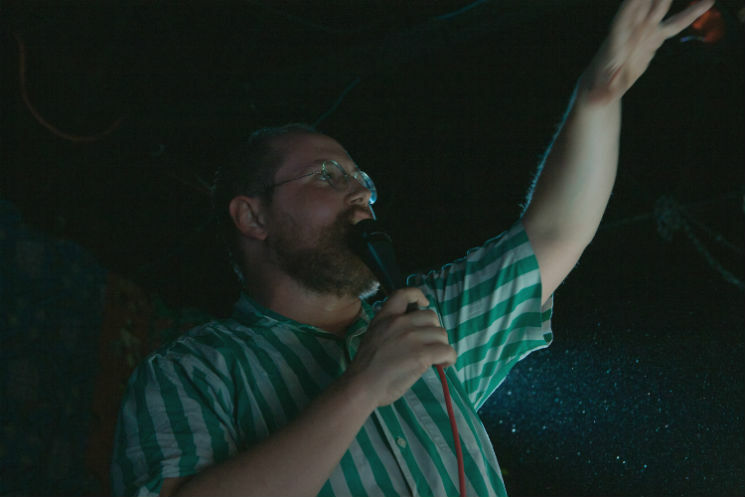 Given that Dan Deacon performs under his own name, it's easy to go into it assuming it's a one-man show, with one dude huddled over a complicated console of doodads and gizmos. But Deacon's eponymous moniker belies the magnitude of his performance. It's never all about him; it's about everyone in the room. Deacon's performance is one part stand-up set, one part Bar Mitzvah dance and one part sweaty, disgusting dance party. He has his own sound tech — a team member handling a series of portable, swivelling lights that added bursts of colour onto pretty much everything — and someone else handling the projections, both of whom were profusely thanked despite their behind-the-scenes roles. With their help, Deacon quickly set up an atmosphere of over-the-top stimulation of all senses, and of collaboration, togetherness. Beginning with some jokes and lighthearted anecdotes about previous trips to Montreal, Deacon wasted no time endearing himself to the packed crowd before launching into his set. His music is manic, poppy electronica with a dash of psychedelia thrown on top of shrieking, effects-laden vocals; it's incredibly overwhelming, but music is not the sole focus of the set. There is no sole focus, and Deacon worked tirelessly to ensure that every part of the venue was working toward bringing people together. Set opener "Sheathed Wings," from his latest LP, Gliss Riffer, kicked things off with euphoric chorus breaks and infectious energy, setting a great pace for the rest of the night. Though the sound system was unable to fully deliver the studio versions' nuanced production, it was forgiven due to the sheer amount of other things to focus on — the lights, the projections, the other concertgoers. Plus, the live renditions still demonstrated his compositional talent, and seemingly endless repertoire of hooks that sounded like an 8-bit video game soundtrack after guzzling a dozen Pixy Stix. Deacon's live set features audience participation, such as when he corralled the crowd into a massive dance circle; though only two people were initially designated to go into the centre and tasked with rotating out with another member of the crowd, the number quickly multiplied as more people wanted in on the fun, another testament to the inclusive atmosphere of fun he created. Partway through the set, Deacon's backdrop came down to reveal a bassist and a drummer, and the music kicked up a notch; the drums in particular were a great addition, bringing crisp rhythms to anchor Deacon's frenetic songs. At this point, the directly interactive portion of the set ended, giving way to a constant, sweat-drenched dance party as the band played tune after tune. Dozens of balloons were launched into the crowd for Gliss Riffer lead single "Feel the Lightning," and the "USA" suite from his 2012 album America brought waves of mind-melting instrumentals to make sure the crowd stayed wide awake long after Deacon's set. Deacon is a master of bringing people together; the infectious, intricate music was as the cherry on top.